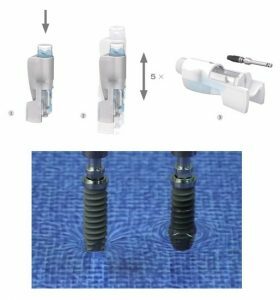 Swiss implant manufacturer, Thommen Medical, have developed a new implant packaging system which allows chairside surface conditioning of their implant. The applicator makes effective chairside surface conditioning fast and intuitive. In a matter of seconds, the conditioning agent contained in the applicator hydroxylates the implant surface to achieve the super-hydrophilic INICELL surface. During the chairside conditioning with APLIQUIQ the surface chemistry is slightly modified by hydroxylation. The result of this process is increased surface energy and improved wettability. The superhydrophilic INICELL surface exhibits a water contact angle of less than 5 degrees. A hydrophilic surface, by comparison, is generally considered to have a contact angle of 90 degrees or less. These properties of the INICELL surface promote spontaneous and complete wetting with physiological fluids, particularly blood.